Friends, I have been wanting to tell you about this book for several weeks but just keep putting it off because the story washed over me in such a wonderful way that I didn’t want to rush through my review of it. Whew! I barely feel like I can relay to you how beautiful and impactful it is. I really want you to read it, ok? And I really think you should have your kids read it, depending on their ages. Encourage your family and friends to read it. Suggest it to the educators in your life. Make sure you purchase a copy; don’t just borrow one. You’ll want this around for years to come, and I bet you’ll have the urge to lovingly mark it up, too. 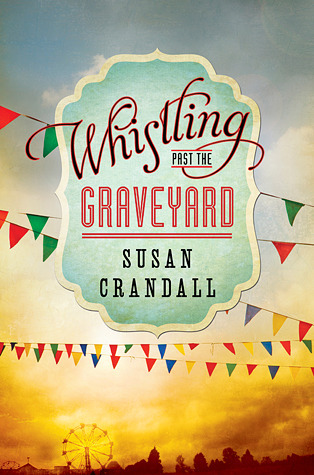 The book that has me so riled up is Whistling Past the Graveyard by Susan Crandall. 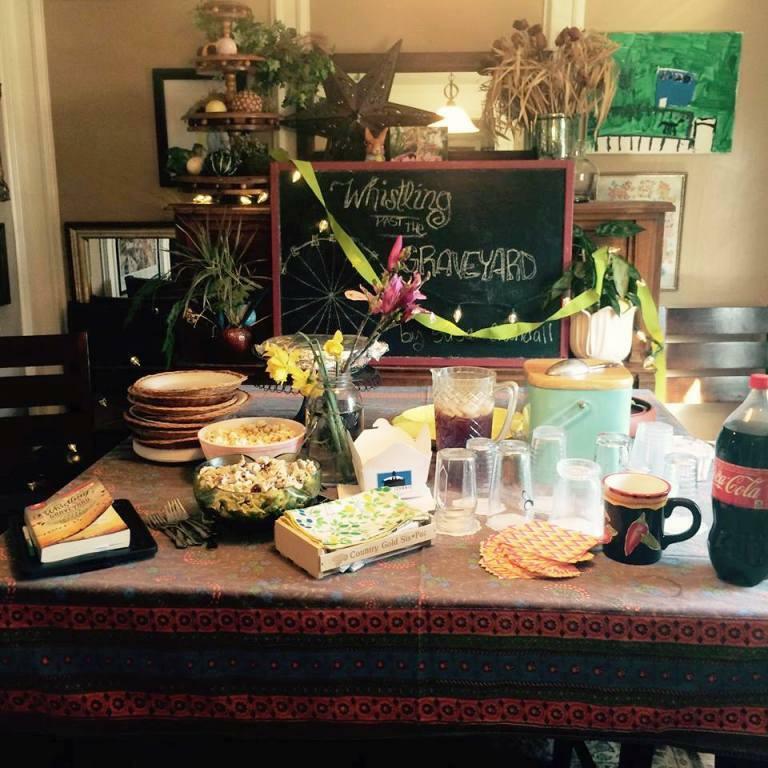 Our famous little Oklahoma book club devoured and discussed this way back in March. We met here at the farm late that month and had a fun evening together eating great food, loving on each other, and talking over what we all agreed is destined to become a modern American classic. The buffet table just before we started loading it with edible treasures. 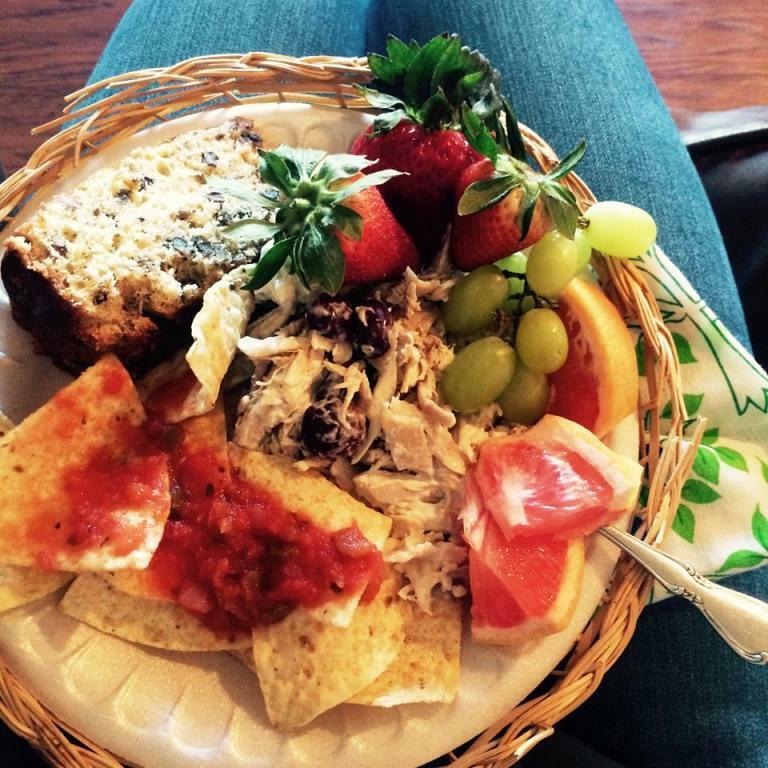 My first plate heavy with said edible treasures. We earn our moniker rightly. 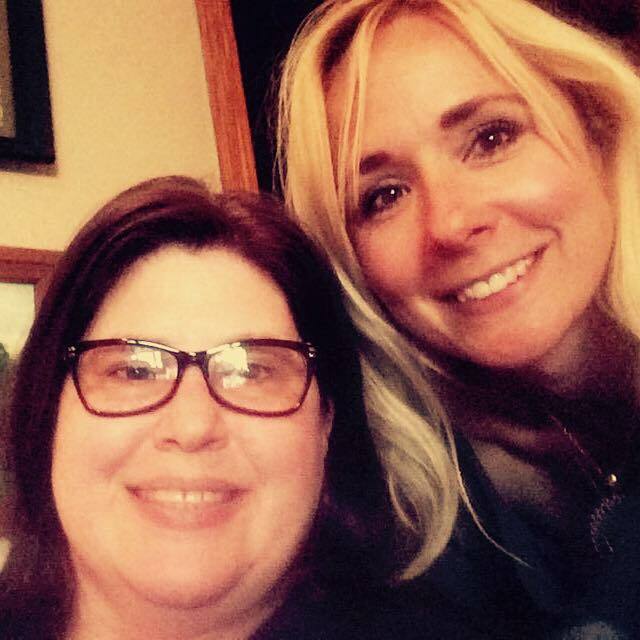 My smart, hilarious, beautiful, long time friend Steph and me. You may recall Steph is our token non-reader, but she has actually been reading! The world is off its axis! 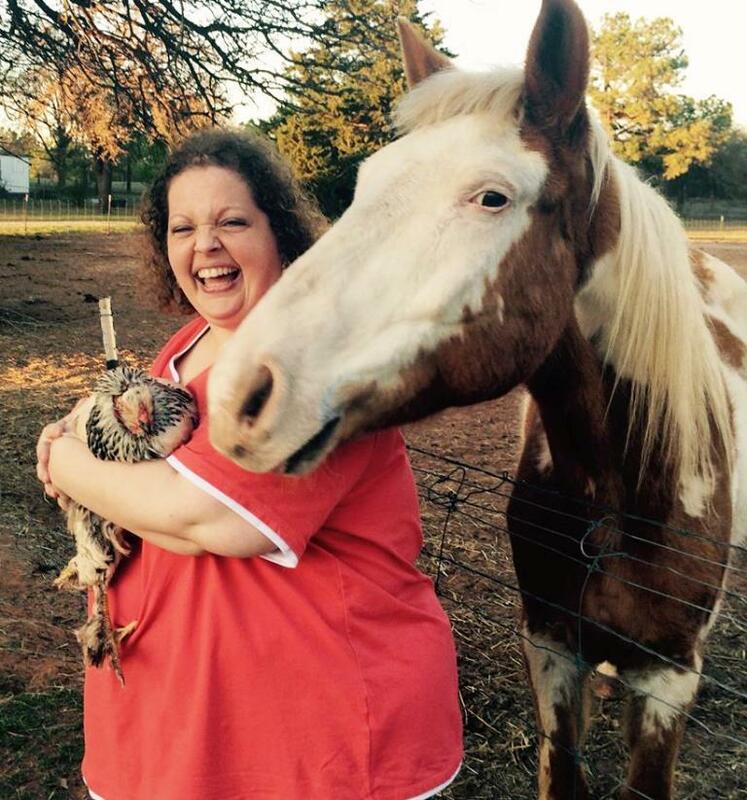 Melissa with Fancy Louise the cuddly hen and Chanta the cuddly horse, who was really greedy for Melissa’s affection that night. So fun! Dinner Club With a Reading Problem always has a memorable time together. Y’all know that by now. But this book, assigned to the group by Seri after she randomly spotted it one day at Target, really got our attention. The story is set in 1963 in the Deep South. It follows a precocious, not always pleasant, but in the end very lovable little girl and the adults closely attached to her life. Together they experience normal childhood stuff plus one grand (and sad) adventure as well as fascinating cultural scenes from that region at that time and the racially charged tension that often occupied it. Whistling Past the Graveyard holds its own with books like The Help and To Kill a Mockingbird, both of which our book club has read and discussed. We have also read Seven Days in May by beloved Oklahoma author Jen Luitweiler, another bit of historical fiction about social turbulence, racially charged issues, cultural differences, and the like. So it’s fair to say we have a good base for tackling these themes. This newest title not only added to our repertoire; it also deepened our conversations. A lot. Something about the characters Crandall wrote and the way they are all a mix of good and bad, whether black or white or rich or poor, something about that peeled away even more layers. Our discussion that night was fascinating and too short. We all thought this book warranted more talk time. For all the painful, universal broad strokes in a story like this, there is also a deep ocean of personal love for the reader to swim in. Personal stories are where the big stories really happen anyway, right? These pages are loaded with believable moments when you feel like you are right there in the characters’ faces. Lots of tangible affection and terribly acute heartache, too. I could share beautiful quotes like this from throughout the book, but I just really want you to read it for yourself. I will personally be enjoying it again and again, just like Grapes of Wrath. It has a classic, better-every-time-you-read-it sort of magic. Flipping through my dog-eared pages I already miss the fabric of the story, its thick, soft, patchwork-quilt quality, the very real characters and emotion Crandall conjured up. The spiritual lessons. Everything! Just wonderful, nourishing, entertaining stuff from the very first page to the last. By the way, this book is a mere 308 pages, and the story moves fluidly. Smoothly. You should be able to tuck it in between more laborious titles with ease, and I suspect it will refresh you deeply. Spoiler Alert: You will probably cry at some point, but don’t give up and stop reading. Promise me you will finish to the end. Okay, that’s it for now! Have you read Whistling Past the Graveyard? If so, what did you think? If not, are you now tempted to grab it and gobble it up this weekend? Tell me everything. “Sometimes laughin’ is all a body can do, child. Hello, Happy Wednesday! How about a little book review? It’s certainly been a while. 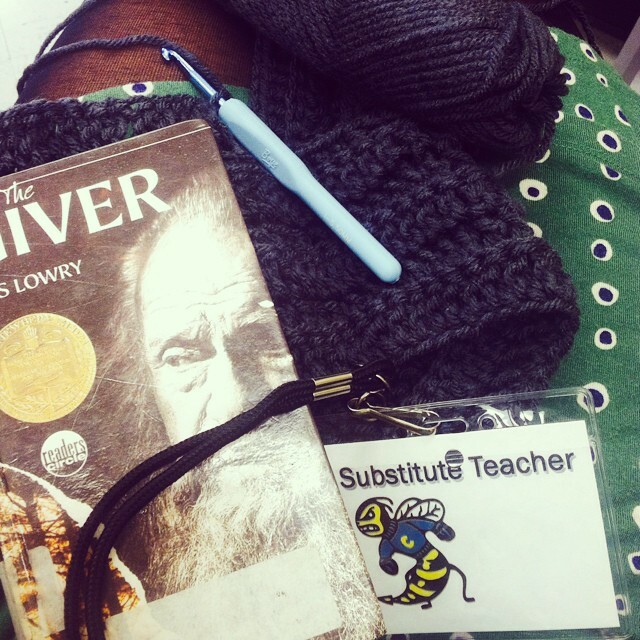 The Giver by Lois Lowry plus a new crochet project by yours truly. Friends, it’s a great book for several reasons. Fellow bibliophiles in my life have recommended this to me before, but it just kept falling off my radar. Do you ever think that certain books cross your path at just the right moment, maybe just when you need them most or right when you are perfectly receptive to the message, whether you realize it or not? Such is the case with The Giver. I may have read it nearly a decade later than everyone else; but it sank directly into my heart in the most wonderful ways. And I had the pleasure of tossing around reactions with about eighty students, hearing what they thought and seeing the joy of reading in their faces. Jackpot. The Giver is part fantasy and part a telling of very simple, relatable human nature. It’s a unique coming of age story that explores societal functions in a way I have never before seen. The author manages to build pretty good characters and plot rapidly, succinctly, and with skill that leaves you wanting much more. (An update on that later.) She uses language artfully but doesn’t smother you with adjectives and prose. She paints pictures neatly, effectively, with great sensation. I loved every page. Do you know how sometimes a book hits all the best high points and only explores the most valuable depths? No dry spells of reading stuff you later decide was unnecessary? That is how The Giver works. Lowry could have made every chapter much more thorough (meaning, painstakingly detailed), but she seemed to know when to quit or when to pull back. It was was refreshing. So that is why I enjoyed it as a reader, and as a prospective writer I took lots of cues from her. As for the message that landed with such timeliness in my heart, it’s about kids who have lived out their childhood and are on the brink of adulthood, the knife’s edge of what’s next and how do I fit into this society, the world at large? What’s my function now that bike riding and recreation and freedom have come to an end? 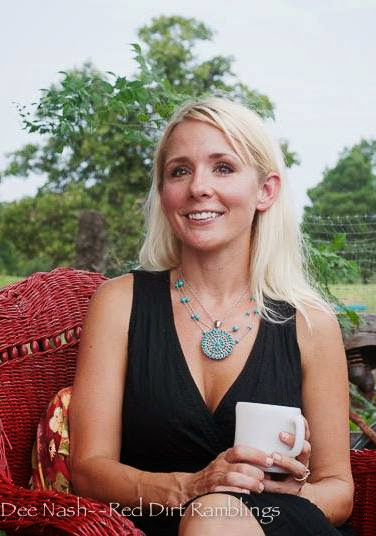 Our oldest is on this exciting and possibility-rich precipice right now, so the connections dazzled me. I was close to tears a few times while reading. The story also explores the power of choice making, the dangers and risks of individuality, and the beauty of it all. It drives home the horrible fallout of something they call “Sameness,” or what I think of as social homogenization. There is also some touching on hot-button issues like weather control and euthanasia, which I thought was interesting. Mostly, though, it’s about the people. Another theme that weighs in is the immeasurable power of memory. Collective memory, really: the wealth of emotion and wisdom we all enjoy by keeping our past close at hand and living in ways that show we have learned from history, both immediate and distant. Collective memory is written as a painful but necessary element in the new society, an irreplaceable gift. But history and memory are carefully guarded, sequestered from the general public because feeling it all is so uncomfortable. They’ve forgotten how to cope with it. Then, together with physical sensation, the feeling of things seems to be the vehicle for experiencing Love. 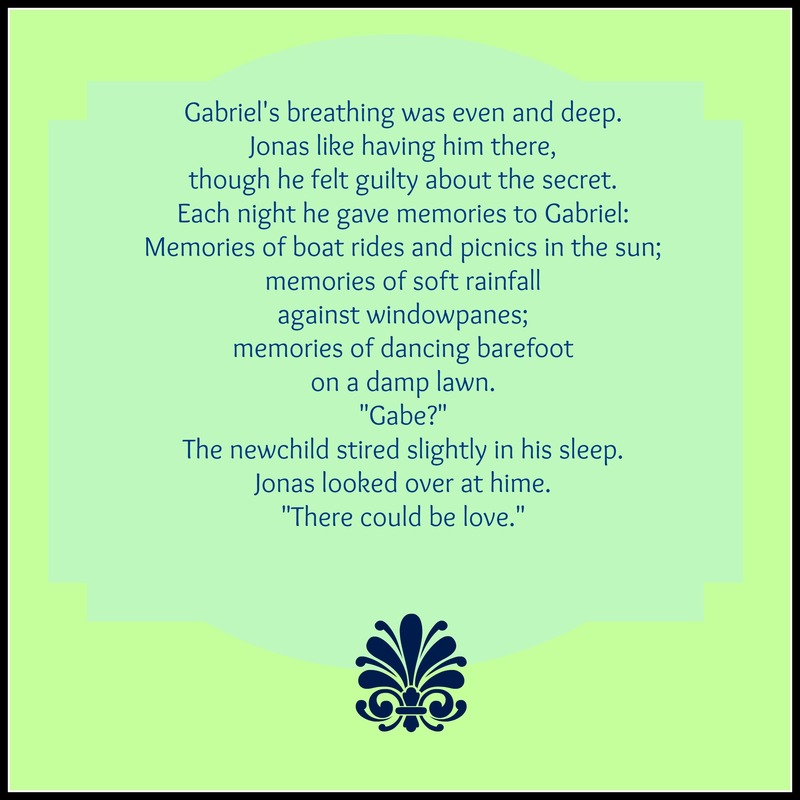 When a character actually tastes loss and grief, inconveniences scrubbed out by the new, pristine Sameness, he finally feels the depth of Love. It’s amazing. I couldn’t stop thinking about the duality of hurt, the balance in life between pleasure and pain. About how it is so clearly the dark times that make us appreciate the light, and how absence makes the heart grow fonder, etcetera. I also thought of Finding Nemo, which pops into my Mother Brain more often than I care to admit. Remember the part when Marlin confides that he just doesn’t want anything to happen to his son? 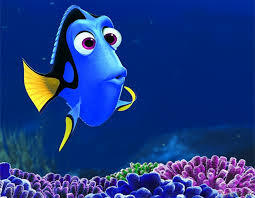 And then Dory, in her simple wisdom, wants to know why on earth he would want that? Yep. In fact, the word love in this new society has become so generalized that it is nearly obsolete. Now, of course, we mention this once in a while to each other, right? We joke about how we love Tex Mex and we love the color turquoise, but yes we also love our grandparents and best friends. And wow we really love coffee and books and amazing husbands. The word itself, at least in American English, is diluted to the point of needing context every time we use it. So the author’s point is driven home well. But she also prompts lots of thinking on how to help each other cope with pain and difficult memories. 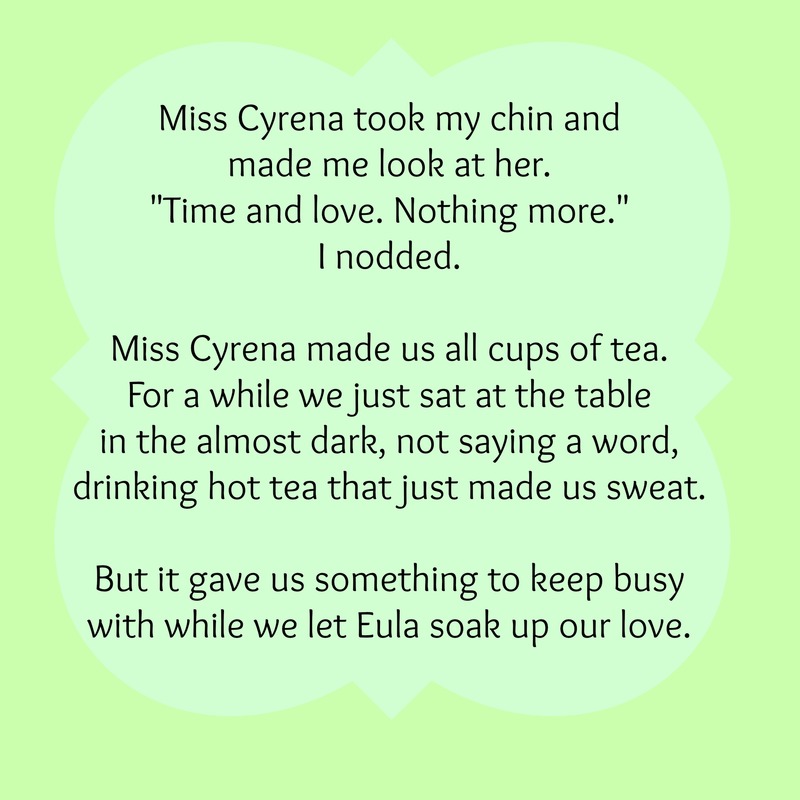 She makes it clear that it is leaning on each other that siphons off grief, and maybe she even meant to say that physical touch was a necessary ingredient. I could talk about this book all day long and into the night and might even try to convince my book club, those ladies who haven’t read it yet, to snap it up so we can tackle it as a group. The Giver is so short but so deep and beautiful! Have you read it? What did you think? What was your take on the Releasing ceremonies? What did you think of age twelve as the time in life to choose your path, or have it chosen for you? If society were to choose your career or vocation for you, what might be chosen, based on what people know/observe about you? And how happy would you be? What did you think of physical touch as it related to pain relief and memory sharing? How close do you think we are to Sameness in different parts of society now? What are the risks and rewards? What did you think of the book’s ending?? Oh that’s right! The ending. I was stunned and felt a bit empty when I read the last page. Luckily a talkative little girl in class was happy to trade thoughts at the exact moment, so I didn’t go quite insane. She assured me that the author received such feedback for more story that she has since written this one volume into a series called The Quartet. I cannot wait to find those and soothe my curiosity. And do you know what I discovered while poking around the internet for the author’s contact information? She is also the creator of the Goonie Bird books! Our youngest loved these in grade school. Very happy memories. So now Lois Lowry has touched my heart twice this week, once for each of my babies, now young women. Okay, three cheers for sudden book finds and enlightening seventh grade days! Thanks for stopping in, friends. Have the best Wednesday ever.